The government exists for specific reasons and has certain powers that enable it to function and achieve its goals. However, the nature of its power is that it has to be contained, or else it will naturally want to expand. If a government becomes too strong it can lead to all sorts of problems and abuses. Government should therefore have no more power than what is necessary to carry out its duties, and the structure of government has to safeguard us from unwarranted acquisition of power. It is almost universally accepted now that a democratic government needs to have separation of powers, which means that the government has to be divided into branches, each with separate and independent powers and areas of responsibility. The common division of branches is into a legislature, an executive, and a judiciary. A system of checks and balances that governs interactions between them ensures that no branch of government can become too powerful: they limit each other, at least in principle. Of course, any government can become corrupt. Constitutional safeguards can fail, in which case the division of power into branches becomes a dead letter on paper. Therefore it is crucial that we don’t put all of our eggs in one basket. The second major principle of balanced governance that we should employ is subsidiarity – an organizing principle of decentralization. 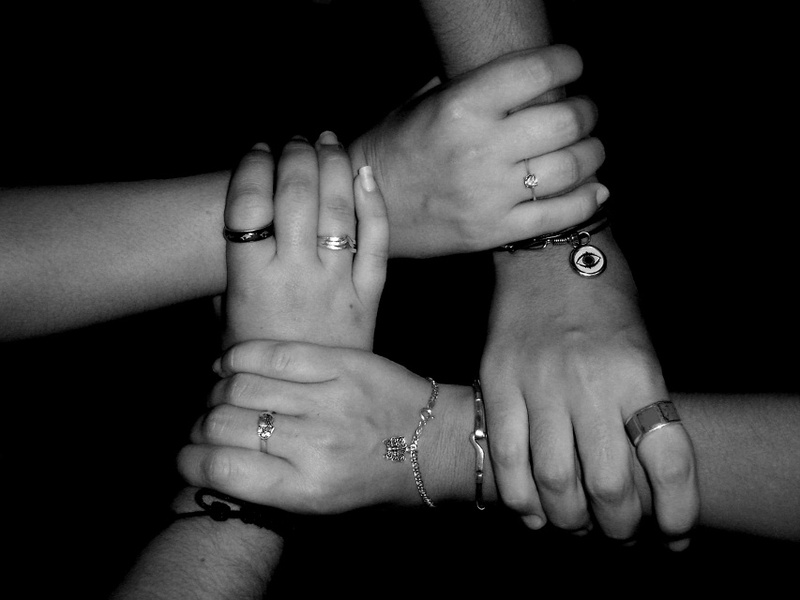 The principle of subsidiarity states that a matter should be handled by the smallest, lowest, or least centralized authority that is capable of addressing that matter in an effective way. This means that governance has to be distributed between the central, regional and local levels. In the case of United States, which is a federal state, there is a balance of power between U.S. state governments and the federal government. The term states’ rights refers to political powers reserved for the states by the Constitution. But no matter if a country is a federal or unitary state, we should aim for a strict adherence to the principle of subsidiarity – authorities of regional and local governments should be constitutionally protected and should cover all matters that could be effectively dealt with on a regional or local level. Of course, there will always be a clash between central control and decentralization, and a trade-off between enforcing certain quality standards and having a freedom to do it your own way. But if we will choose to follow the principle of subsidiarity, we may find the optimal balance. And within that framework, people living in different jurisdictions could enact different solutions for the same problem, through a democratic process on a regional or local level. Local people often know best what is the right solution for their particular circumstances, and citizens could always vote with their feet and move elsewhere, to a different region or community, if they simply could not come to terms with the enacted solution. The third major principle to consider is the Goldilocks principle. With regard to the power of government it means that a government should not be too powerful, and it should not lack the power necessary to perform its functions; its power should be “just right”. When the power of government is just right we get an optimal balance between free market and government intervention. The same could be said for the balance between freedom and security. The government has the responsibility to maintain peace and order, but when it turns into an oppressive police state, then this balance is lost. 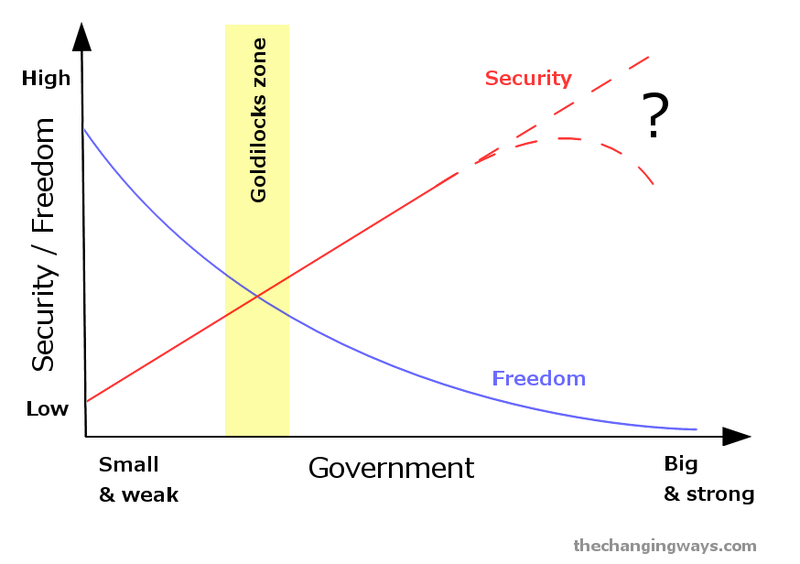 Graph: Trade-off between freedom and security. If we want to maintain a functional democracy it is absolutely essential that we preserve civil liberties granted by the constitution. In most modern states the constitution has supremacy over ordinary law, and the purpose of having such constitution is to set limits on government actions. The government should be limited, not only to prevent tyranny, but also to minimize incentives for special interest groups to capture its power. The bigger the government is, the greater the possibilities for political corruption are. Of course, I’m not an anarchist or a libertarian, for reasons that I’ve already explained in previous posts, but I certainly don’t support full-fledged statism, either. So, we have a difficult situation now: probably all of us want that the power of government is “just right”, but we may not agree on the specifics of this arrangement. Some of us are more liberal, some are more conservative. Some people are afraid of terrorists, others fear police brutality. Some people want Big government to save them from Big business, others are convinced that Big business is the consequence of Big government. These differences are partially inborn, and partially result of different life experiences, which all leads to a biased outlook of the world. And even if we could find and agree on “the sweet spot” (the Goldilocks zone), would that arrangement be stable? The real issue here is that the government is both the problem and the solution: one role of the government is to regulate corporations, so that they don’t engage in activities that cause collective harm, but this role becomes problematic the minute that special interest groups capture the government. Our quest for the optimal size of the government looks more and more like being between Scylla and Charybdis, and nothing like finding the sweet spot. Many people have made similar observations as I have above, and some have even proposed radical solutions. The least radical proposal of all is the call for some form of direct democracy. I think that direct democracy could eventually become extremely important on a local level, but a system of direct democracy on a regional and national levels would have some serious shortcomings to overcome: in a large political entity it is difficult for a system of decision making to include all three desirable characteristics: participation, equality, and deliberation (see Democratic reform trilemma). I believe that in the short run, a system of semi-direct democracy (representative democracy with instruments of direct democracy) such as the one in Switzerland, is more likely to be successful. In the long run, electronic direct democracy (E-democracy) could perhaps prove viable, but I still wouldn’t prefer a pure form of direct democracy. First, I think that a much better option would be liquid democracy (a form of direct democracy where citizens can at anytime choose a proxy/delegate to vote on their behalf) – watch the video below for an explanation of liquid democracy, as well as a presentation of the Swiss model. In addition, I believe that a mixed system that would also preserve some elements of representative democracy, would be the best of all, because it would provide a buffer against potential irrational swings of the electorate, and a safeguard against instability in the event that modern technology, on which E-democracy relies upon, fails for whatever reason. However, calls for democratic reforms in the direction of direct democracy miss the bigger picture. Direct democracy, no matter what its advantages may be, is still part of the concept of governance. As I have said, I’m not an anarchist, and I believe that there is a good reason for state to have a monopoly on the legitimate use of force. But, to expect that the problems associated with the misuse of governmental power could be completely solved within the framework of a government, is pretty naïve. What is really needed is the strengthening of civil society, to act as a counterbalance to both the government and the Big business. That is going to be the focus of the next part.